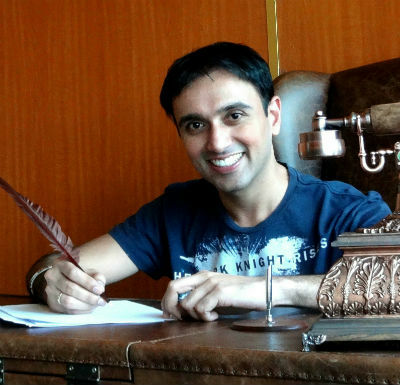 Allow me to introduce Dr. Vineet Aggrawal, a doctor by qualification and an avid storyteller by passion. Probably the roots of love for Indian mythology and culture are implanted into him at an early age when he used to hear incidents from ancient Indian Literature as bedtime stories. So far, he has written three books exploring the legends of Vishwamitra, Parshuraam and Bharat. We’ve got a chance to read the first two of them and thus the interview is conducted in the context of them only. Hi Vineet, greetings from Team ThinkerViews! We are glad to have a conversation with you. All your books are getting both commercial success and critical acclaim both, and obviously you are enjoying it. Can you share your feelings? Thank you so much for your kind words and the invitation for this interview. It is indeed a dream come true for me to receive such a good response for all the three books – “Vishwamitra“, “The Legend of Parshu-Raam” and “Bharat“. It is even more heartening since they are getting readership from people of assorted age groups and nationalities. Just goes to show that our stories have the potential to attract diverse audiences and it is about time someone delved deeper into these! As I am fond of saying – I am a doctor by qualification, manager by profession and a writer by passion. I completed my medical education from Mumbai and practiced for couple of years before moving into management and today work with an Indian MNC taking care of Asia region. Fortunately my work allows me to travel to different parts of the globe and I use the opportunity to explore the connection that they have historically shared with India and the influence our stories have had on them. I have been lucky enough to visit far-off places in countries like Cambodia, Indonesia and Vietnam that still point towards our common heritage and that gives me much food for thought while writing. We often see that usually an author (when came from a specific field) try to explore his world in his book. For example John Grisham writes Legal thriller(s), Ravi Subramanian goes with banking thrillers, Maya Kavita writes thriller about IT industry; you are a student of science stream, why have you decided to explore mythology? I get this question a lot of times but for me, science and religion or mythology are not contradictory and are rather complimentary. Many of our mythological tales talk about things that are absolutely impossible without taking science into account. Similarly, many of the concepts mentioned in our scriptures have given much food for thought to scientists not just in India but in the western world as well. I use my scientific background to analyze the so called “myths” and derive logical conclusions from them. My blog “Decode Hindu Mythology” actually delves into many such beliefs and looks at them using different scientific disciplines to help a modern reader make sense of them. The fact that it has more than 2 million views certainly shows that my efforts have resonated with many readers across the globe! It seems you are an avid reader. And possibly you have explored a remarkable amount of mythological literature and Puranas. Can you tell us more about your involvement with ancient Indian literature? Yes, I have been fascinated about stories from the Puranas right from my childhood. I grew up hearing stories of Krishna and Rama from my grandmother and then lapping up the additional information that the “Amar Chitra Katha” series provided. After growing up I began reading up on other world mythologies and realized that our stories have not been explored as much as those arising from the western world. Even the genealogies of our main mythological characters are not very well outlined whereas you can easily find family trees of the Olympian gods on the web. Sharing an example from my own books, not many people are aware that Vishwamitra and Parshu-Raam are actually blood relatives! The Puranas give complete genealogies of the Solar and Lunar Dynasties in which were born Lord Rama and Krishna respectively, yet it is difficult to find a person who knows how far apart they were or which other famous kings belonged to their respective clans. There is so much to explore in the Puranas that one lifetime is definitely not sufficient. Still, the more we read from these as well as other scriptures, the more we learn about our past and that is the thought that keeps me going on even today. Do you think that it is possible that “Vedas” and “Puranas” are the legacy of a highly advanced earlier civilisation from our pre-historic past? The stories from Vedas and Puranas give us an insight into the minds of people who lived way in the past so they are automatically assumed to be more primitive. But there are so many instances of scientific phenomenon like planetary travel, Einstein’s time dilation, going back into the past etc. that it is foolish for anyone to say that these stories were written by simple nomads. It is very easy to just brush away the mention of celestial weapons, Vimanas and Lokas as poetic fantasy but any student of science will recognize the many scientific references in these scriptures. Doing a daily job along with following passion(s) require effective time management, how did you manage it all? Any time management tips you can share? Well, to be honest, I never really understood how people are not able to find time for the things they love. Even if one works ten hours a day there’s always a half hour before bed that can be devoted to reading. And then there are the weekends that can be effectively utilized. Since I travel a lot for work I make use of the time spent at airports and even long flights to catch up on both the reading as well as writing as much as I can. I would say a bit of both! Inspiration can strike you at any time or place so one has to take full advantage of that but getting it into a somewhat structured form is also important. When I write articles it could be due to something I have come across that has triggered a particular thought process but when am writing a story, I consciously make an effort to think not only from the point of view of the main protagonist, but also the other supporting characters. It is only then that a book becomes complete for me. The book cover plays an important role in book selling, were you involved in book cover designing process? How much? What is your vision about the cover page of each of your books? Yes I have been involved with the cover designing of all my books. Sometimes the publishers have their own vision and it may not coincide with that of the author but I have been fortunate to have worked with some decent creative teams. The covers of my first and last book are pretty much as per my vision but that of the second one had more inputs from the publishing team hence it is a mix of our efforts. Can you tell which part(s) / scene(s) in the book(s) you enjoyed writing the most? There are many scenes that I loved writing during the course of the three stories especially the war sequences. But my absolute favorite is the scene from “Vishwamitra” when he discovers the Gayatri Mantra. I hope the readers would also find it interesting since it is based a lot on my own personal experience. Similarly, in “The Legend of Parshu-Raam” the vision of Shiva that the young Brahmin boy receives is also close to my heart. In “Bharat”, I loved writing the confrontation between Dushyant and Shakuntala as well as the interactions that Vishwamitra has with his grandson Bharat. What are the major challenges you faced when writing these books (if any)? Oh yes there were many challenges indeed. For starters, the life stories of none of my protagonists are given anywhere in a single scripture and not even in a smooth flow. If you write a book about Lord Rama or Krishna, you have the advantage of having the entire plot in front of you. But for me, it was a task to dig deeper into the scriptures trying to find enough references to give the stories a proper narrative. My second task was to find out the actual places related to these characters and recreating the lessor known cities like Kanyakubja and Mahishmati. Everyone knows of Mathura as the birthplace of Krishna and Ayodhya as that of Shri Rama but do you know where Parshu-Raam was born? I managed to find the place of his birth and even visited it to give the description an authentic feel in the book. Unless you are churning out a complete fiction book, while writing about ancient times you also need to have an accurate understanding of the social and moral regulations that existed in those times and write accordingly. These were a few of my challenges but they added to the thrill of writing for me and I hope the readers area able to appreciate them as well. Writing a book is probably similar to giving birth and just as they say a child gives birth to its mother, it is also very true for an author. Each book is a creation of months of perseverance and hard work and after completing it there is a sense of elation and relief that probably only a parent can understand! Writing these books also made me more adept at researching our scriptures as well as made me aware of so many different facets of these characters. But most of all, they have taught me patience since there is so much more that needs to be done before the author’s manuscript becomes a published book! Well my journey to becoming an author truly began with my blog. It was in 2011 that I started sharing my views on “Decode Hindu Mythology” and it was because of its popularity that I received an offer for publishing in 2014. I did not have to go through the usual rounds of rejections and resubmissions but that’s only because of the good readership that I had managed to generate with my blog. Refreshing to read a non traditional interview.